The Dexter Russell V-Lo line features a new state-of-the-art handle. The unique Dex-Tex Armadillo texture is soft to the touch but firm enough to handle all your cutting needs while still having a modern, attractive look. The stain-free, high-carbon steel blade is individually ground and honed to ultimate sharpness. Carving forks are used to hold meat while cutting and can also be used for moving and serving food by spearing it. 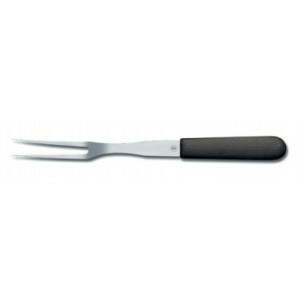 The Dexter Russell V-Lo 13″ Cook’s Fork has two, curved tines and the quality only Dexter can offer.